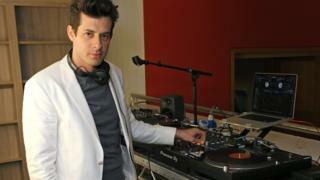 Almost four years on since his number one album Uptown Special, Mark Ronson has a new album in the works and it's as much designed to hit you square in your heart as get you on the dance floor. Speaking to the BBC following an exclusive playback of a handful of new tracks, Ronson - who recently produced albums for Lady Gaga and Queens of the Stone Age - says the songs have come together with the help of kindred spirits. "That's kind of what made the collaborators on this record - more so than choosing a person for a musical style - they were all like-minded people, or people who were going through some traumatic personal stuff," says Ronson. The 43-year-old producer and DJ has just gone though a divorce from French model and actress Joséphine de La Baume and says it's given him a different approach to his own music, putting lyrics and emotion ahead of the beats. "I've obviously worked with people and got to work on records where people have an incredible emotional output that goes on their music, like [Amy Winehouse's] Back To Black," he says. "It doesn't always have to be depressing, I tried doing some other music, whatever I could do not to relive Uptown Funk but the only stuff that started to stick was the stuff that moved me and made me feel melancholy. "Once I had two or three of those, I started to see all this as an album." Ronson introduced the new tracks, which feature vocal performances from Miley Cyrus, Swedish pop star Lykke Li and newcomer Arkansas singer-songwriter Yebba, as a series of "sad bangers" - heavy on emotion but equally serious about filling dance floors. Afterwards, he clarifies: "Obviously, I didn't invent 'sad bangers', far from it, Don't Leave Me This Way, I Will Survive, the entire outputs of Robyn and Drake and all the emo stuff but it was nice, even if I had to go through some stuff to have a bit of a concept present itself because then otherwise my records don't have a reason to exist. "I'm not saying that the bad stuff was worth it but [the music] was definitely a positive by-product of that." Other voices on the as-yet-untitled record will include newcomer King Princess - a New York-based artist who is being hotly-tipped for a big 2019. She is also the first signing to Ronson's own Zelig label. "I'm just a massive fan and love watching her develop with leaps and bounds with everything she puts out," he says. "She just came to Shangri-La (producer Rick Rubin's Malibu studio) where we were hanging out for a week. "We tried to get it right three or four times and I said, 'This is a great song but give me something from here [Ronson points to his chest], something that hurts and she wrote this song and came back and I was like, 'This is wonderful'." A quick visit to Ronson's Wikipedia page shows the impressive list of artists he has worked with since his debut in 1997, but has anybody ever said no to a collaboration? "Yes, everyone says no at first and then I kind of like wear them down," he laughs. In front of an audience of largely music industry people, Ronson joked the new music has arrived as he "owes the label an album" but he also claimed young fans are caring less and less about the format. Stats provided by trade body the BPI earlier this year said streaming now accounts for more than half (50.4%) of all music consumption in the UK with a record 1.5 billion streams served in one week last December. In the UK, album sales actually saw a rise, in total, 135.1 million albums were sold, an increase of 9.5%. However, in the US - the world's biggest music market - sales have plummeted. Figures published by the RIAA (Recording Industry Association of America), showed sales dropped by more than 25% in the first quarter of 2018, compared with 2017. Joshua Friedlander, the senior vice-president for Strategic Data Analysis for the RIAA told the BBC: "The changes we're seeing in the market are a reflection of the way fans are listening to music, but ultimately it's up to each artist and his or her label partner to decide how best to release their music - as a body of work in an album or EP, a singles strategy, or a combination of both. He added: "While revenues from traditional album formats such as CDs and digital albums have declined in recent years, they are now being more than offset by an increase in revenues from streaming." "People are going to stream and listen to whatever they want," said Ronson. "But when there's something that really sits together, like a concept - like the new Metro Boomin album - because he's about the people that he's come up with, like 21 Savage and Travis Scott - that record's come straight in at number one because you know that album sits together. "People like Solange and Daft Punk can put a record out and you really believe it was made that way. I guess for me it doesn't matter so much whether it's a dying art form because it is the only art form that I know."